Before I moved to the desert, I lived in Seattle, and within walking distance from my apartment was a modest surf shop. I’d rent stand-up paddleboards and, with my small dog at the helm, explore Puget Sound. I’m not sure there’s anything I loved more about living in the Pacific Northwest, and the moment that burns most brilliantly in my mind is the afternoon that I looked down into the water, not too far from the docks, and saw what looked like dozens of miniature moons glowing upward. I had no idea there were jellyfish in those waters. I imagined jellyfish to be creatures that would wash up on some always-sunny resort-style beach, scaring tourists who were already halfway to sunburn. That I might find them so close to home had never crossed my mind. 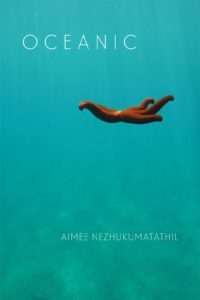 This is the memory that first came to mind when I encountered Aimee Nezhukumatathil ’s Oceanic. This is, in part, because of the title. Moreover, from the poetic structures that cultivate dazzling settings to the metaphors that brim with possibility, Oceanic is an opportunity to view our world and our existence in ways that, perhaps, we hadn’t previously thought possible. feather across my hundred blue eyes. ready to nibble and foam for days. Carry me in the gobble of your beak. The lines ebb and flow until the body of poetry reaches the bottom of the page, but this is only the beginning. Nezhukumatathil’s attention to form is notable throughout the collection, including her “Travel Mommy Ghazal,” “End-of-Summer Haibun,” and the single right-justified poem, “When You Select The Daughter Card,” “a part of a reimagined tarot deck.” This flipped justification – from the left to the right – immediately reminds me of turning over tarot cards, and this poem demonstrates the many ways that a daughter might lead us to see life in a different light, remind us to look “for the moon-glow on every leaf and sea grape. / Such wonderment and safety in store.” Nezhukumatathil closes the poem on this note, and her juxtaposition of “wonderment and safety,” a reconciliation of two states of being that don’t often go hand-in-hand in our oceans-sized world, is one of the many compelling moments in this collection. Another way in which “Self Portrait as Scallop” introduces the collection is by creating an environment in which there’s a palpable possibility for human connection with the natural world. Nezhukumatathil compares herself to a scallop, one who speaks to a bird: “Carry me in the gobble of your beak. / I’d rather be set like a jewel in your nest.” These mollusks return again and again throughout the book, almost as if they come and go with the turns of the pages, making great, albeit temporary, escapes. They return already in the third poem, “On Listening to Your Teacher Take Attendance.” After the well-meaning teacher “butchers your name,” you are told, “when / everyone turns around to check out // your face,” “just picture all the eyes as if your classroom // is one big scallop with its dozens of icy blues.” Oceanic is a collection of journey and discovery. We witness the papa penguin’s “fierce tenderness” that “would scare / even a crabeater seal five times his size” as well as the Venus flytraps that “snap shut when the trigger hairs are touched not once, but / are tapped exactly twice.” Nezhukumatathil writes, “The needles from the hoop pines / inside the cloud forest remind me / of the bristles of my son’s baby brush,” and I wonder if this is one of the moments that she has in mind when she exclaims that love “can be so loud.” These pages are an opportunity to discover the details of, and to rediscover our connection with, the natural world. Nezhukumatathil’s humor allows the book to make exhibits of the dangers of our disconnection. There are two found poems in Oceanic, “One-Star Review of the Taj Mahal” and “One Star Reviews of the Great Wall of China.” The concept of making a poem from online reviews is somewhat comical, and this brings enough levity to allow an exploration of human nature. In the second of the found poems, we find lines such as “This is not an experience of a lifetime” and “No one can speak English!” as well as “It was raining” then “It was foggy” then “It was raining” again. These poems have been placed in the back half of the book, after the reader might have time to recalibrate their lens to be less cynical than before, which allows these pieces to serve as particularly effective commentary on an almost dystopian side of society. Since my encounter with the bloom of jellyfish, I have learned that their increasing presence marked a dangerous shift in Puget Sound’s ecosystem. They compete with fish for what was once their food, and they do not provide much nourishment for the other creatures. Nevertheless, I can cherish this memory, as Nezhukumatathil reminds us that our moments in this world are not often binary, but typically both remarkable and messy. My encounter with those sea creatures inspired me to learn more, not unlike Oceanic, which reawakens my curiosity for a world that still holds so many undiscovered wonders.